Link has to be one of the coolest characters around, and he wears tights so you know he has to be extra cool to make up for that crap. As after as Legend of Zelda games, I am a Link to the Past advocate but I do like the Windwaker art style. The young, cell-shaded Link was nothing short of pure Miyamoto genius. 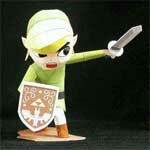 Let us all immortalize this Windwaker Link with a papercraft model on our desks. Together with Link embark on a cubicle adventure to reclaim the Triforce from the evil Lumberg and his TPS Reports of DOOM. Slash and strike with Papercraft Link.